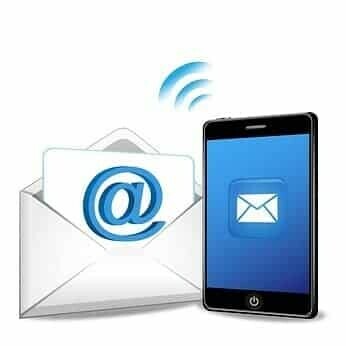 Email is a mobile communication method. Many of us check our emails on our mobile phones or tablet devices, but new data shows that 53% of all emails are now opened on a mobile device, rather than a desktop computer. The research also shows that 50% of clicks from emails now come from mobile devices, such as smartphones. In other words, if your emails are not mobile-friendly you are reducing the likelihood of clicks through to your website as well as the possibility of any sales. Indeed, research shows that sales from mobile phones are up 40% compared with the previous year. That means more and more people are seeing email as a mobile method of communications, not something they do sitting down at their computer. For businesses this means a potential change in attitude. It means that we need to realise that people are no longer having an “email session” at their PC; instead they are checking and responding to emails “on the go”. This means they prefer short emails, not long ones, perhaps. It also implies that email recipients need easy-to-follow messages which are focused and have clear calls to action. Great long, multiple-offer emails are probably going to become less successful as people increasingly use mobile for email communications. If you are still using desktop email clients to compose email messages, you are likely to have lowering response rates to your campaigns as your emails will not show up so well on a mobile device. What you need are email marketing systems that provide responsive designs for emails, adjusting the size and format according to the type of mobile device the recipient is using. Mailchimp is one service which provides this feature automatically for many of its templates. You could also use a responsive design system, such as Responsive Layout Maker from Coffee Cup Software. Crucially, though, it is the way we perceive email that has to change. No longer is it mainly a thing we do on computers. It is now mainly something we do on smartphones. And because of that we need to change the way we think about email marketing, providing emails that work on small screens that people navigate using their thumb. Complex emails will not work on that situation, even though they work well on desktop computers. Time to re-think the way you focus on email marketing.